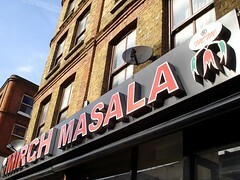 A small chain of curry restaurants sprinkled over London. The first of them opened in 1995, in Norbury. bob has been to three of the branches. The food has always been good; however the poppadoms are like wallpaper paste, so don't bother ordering them. Last edited 2014-03-10 11:24:35 (version 5; diff). List all versions. Page last edited 2014-03-10 11:24:35 (version 5).